Knob and tube wiring in an attic, with NM cable spliced to it. This circuit was not designed to carry the extra load newer wiring may demand. All these junctions should be made in an enclosed box. Knob and tube wiring was the earliest standardized method of electrical wiring in buildings, in common use from about 1880 to the 1930s. Older homes may have knob-and-tube wiring for all or part of their electrical system. Such wiring systems may require replacement and modernization, as they are generally inadequate for modern levels of power use. 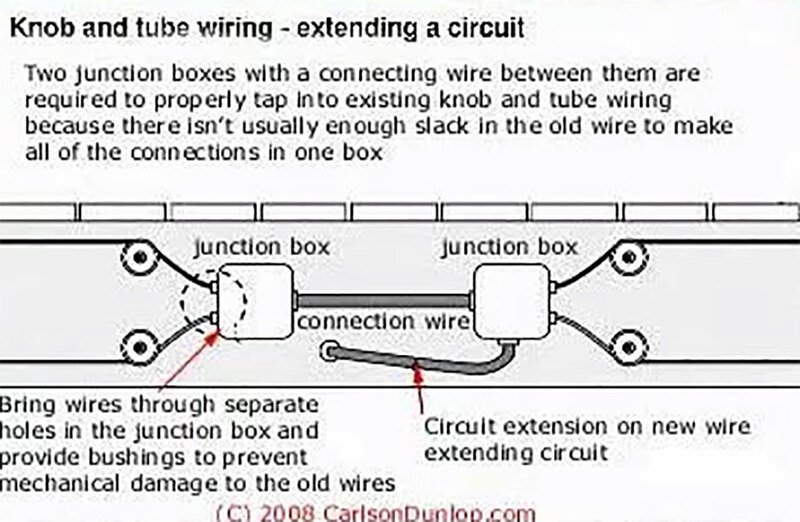 Knob-and-tube wiring may have been damaged by renovations done in the building over the years, its wiring insulation may have become dried-out and brittle, or it may have been damaged by rodents or carelessness (for example, hanging objects off wiring running in accessible areas like basements). Most lighting fixtures will have brittle insulation as they age due to higher wattage and heat of modern light bulbs. Many originally had 40 watt bulbs, when was the last time you saw one that small in a room lighting fixture? The excessive heat from a modern light fixture can cook the insulation off, since this wiring had a much lower tolerance to high heat conditions. This is the book from back in the day when electricity was a new thing in homes. Look just how simple the instructions were 100 years ago.